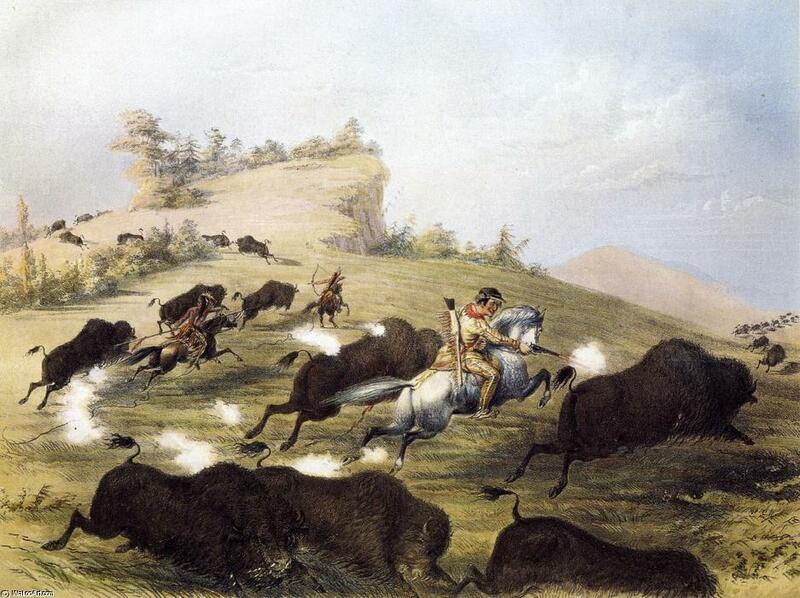 George Catlin: “Catlin the Artist Shooting Buffalos with Colt’s Revolving Pistol” (1855). In the 1850s, Samuel Colt commissioned George Catlin to produce a series of oil paintings depicting Catlin’s various exploits in North and South America. In all ten of what became known as the Firearm Series, Catlin uses Colt revolvers and rifles either to hunt with or impress the native populations of the continent. Six of the paintings were selected by Colt for mass-production (as lithographs) to promote his wares in various print media between 1855-57. There are interesting differences between the oil paintings and the lithographs. For example, in the above lithograph, Catlin is wielding a 1850 U.S. model revolver with a seven-and-a-half-inch shortened barrel, whereas, in the original painting, he is seen carrying the more cumbersome nine-inch barrel 1847 model. Colt and Catlin’s commercial partnership raises a number of questions about the collaboration of art and industry in American history; in fact, as Elizabeth Mankin Kornhauser has noted, it is the earliest example of “a renowned artist providing a product endorsement” (“George Catlin and the Colt Firearms Series,” in Samuel Colt: Arms, Art, and Invention [Yale UP, 2006]: 203). We might then ask: How has the aestheticization of guns influenced their perceived role in American culture? Does the visual romanticization of firearms lead to an effacement of their actual purpose? Please feel free to add to this brief list of inquiries. Anything in our society that is beautiful is perceived as good or admired. So if a gun display in an art museum portrays the guns as beautiful with their intricate carvings, pearl handles, gold inlays, etc. then to society they are admired. Just the fact that they are in a museum elevates their status as something to be treasured. Whether or not this is good is something to be debated.